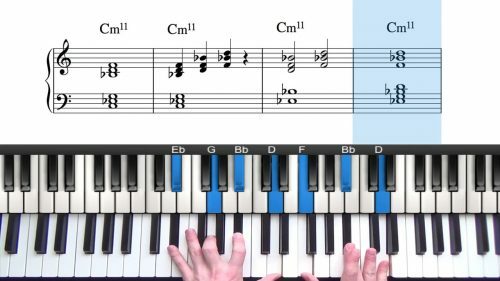 In part 2 of this tutorial we build upon the theory in part 1 to create a full solo piano arrangement incorporating chord extensions, sus chords and altered dominant chords. 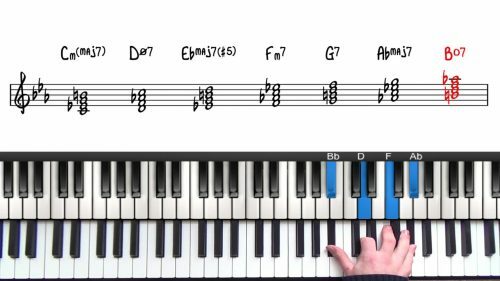 Fist we look at a few ways you can embellish the melody in the right hand. This helps to add character and personality to the arrangement. To get inspiration for your own embellishments, make sure you are listening to lots of different recordings and transcribing sections that you like the sound of. We then introduce some interesting counterpoint using scale runs and arpeggio shapes in our left hand. This adds balance to the arrangement and creates melodic interest in the lower registers of the piano. This is a nice tune for applying suspended harmony. In particular we focus on sus to altered dominant movement over the V chords in the progression. The sus voicing delays the sense of resolution and is a useful device when the chords are sparse. Most of the chords in this tune last for a full measure which gives you lots of time (and freedom!) to play around with internal voices. Remember that you can always move from the dominant sus chord to the tritone before resolving to the 1 chord. This is a great sequence to add more harmonic interest to vanilla 251s. This is a wonderful tune for exploring passing chords. We add chromatic dominant passing chords built a half step above the target chord which adds harmonic variety and interest. We also apply suspended passing chords over the dominant 7ths in the form. We do this by first playing a 9sus or 13sus voicing, and then altering the 9th when we resolve the suspension to the major 3rd. This is a common substitution over dominant chords and one which you should be familiar with.